Courtney Brown, Ph.D., founded The Farsight Institute as a research and educational organization in 1995. He is Director for this unique nonprofit educational organization. Dr. Brown has published a number of books on the subject of remote viewing. His most recent book, Remote Viewing: The Science and Theory of Nonphysical Perception, is an in-depth scientific examination of the remote-viewing phenomenon, particularly with respect to how remote viewing is performed using procedures that are derivative of U.S. government funded research efforts. This book deeply engages issues related to the physics of psi functioning. In addition to his commitment to advancing basic science research of the remote-viewing phenomenon, he also has a personal and separate interest (some would call it a hobby) in applying remote viewing to investigate the subjects of spirituality and extraterrestrial life. His speculative nonfiction book, Cosmic Voyage: A Scientific Discovery of Extraterrestrials Visiting Earth, describes his first investigation using remote viewing as a data gathering technique. It has been published both in hardback (Dutton) and paperback (Onyx), and in various languages. 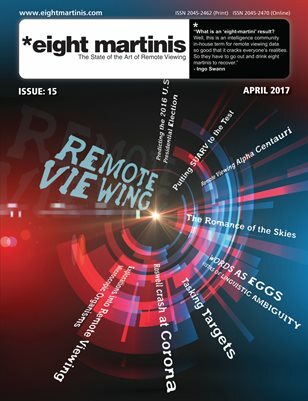 His second speculative nonfiction book on the subject of remote viewing, Cosmic Explorers: Scientific Remote Viewing, Extraterrestrials, and a Message for Mankind, continues much of the substantive content of Cosmic Voyage, but it also contains an entire text explaining the mechanics of Scientific Remote Viewing®. It was also been published in hardback (Dutton) and paperback (Signet). Both books are available as free downloads. You can visit Dr. Courtney Brown’s personal web site. I have found my interaction and communications with Courtney both interesting and expanding and look forward to working on remote viewing with Courtney if he will have my participation well into the future. Multiple Universes Project – Predicting the future has been one of the most difficult things to do with remote viewing. People often ask that if someone can remote view, what will happen at some point in the future? Many have tried to use remote viewing to answer that question, and some have occasionally met with success. But to date, only one experimental design has ever worked consistently to correctly predict the future. We now have an idea why that particular experimental design works, and why other experimental designs do not work as well. The reason may have to do with the existence of multiple universes, and we now have a way to test for this directly. Remote Viewing the Future with a Tasking Temporal Outbounder – COURTNEY B ROWN – Peer reviewed paper – 2012.